Being conscious of our water usage is something that is both our social responsibility to the community and our commitment toward a healthier, longer-sustaining environment. What is a Landscaping Violation? How is the Violation Cured? “Landscaping shall mean the planting of trees, shrubs, or grass, or other live plants, or the use of decorative landscaping (rock or bark) to improve the appearance of the land.” Note that “grass” was just one of the landscaping options presented. Many property owners are investing in drought-tolerant landscaping and/or decorative landscaping in place of grass. This is a great alternative water-wise and reduces your long term maintenance costs –a win-win alternative! Why can’t I leave these landscape areas as bare dirt? 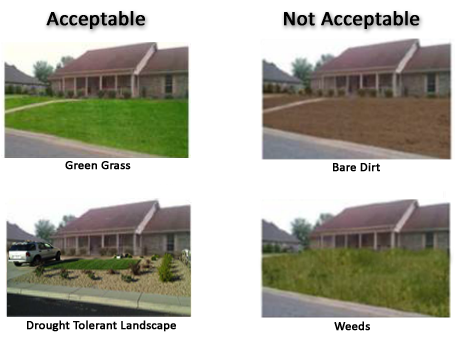 The City wants to ensure that neighborhoods maintain attractive landscape areas within residential neighborhoods. Trees, shrubs, and ground covers provide shade, absorb carbon dioxide, supply oxygen, reduce soil erosion, decrease energy use, reduce storm water runoff, reduce fugitive dust, and ultimately save water. If you receive a Correction Notice, understand it is because Oakley is committed toward ensuring we remain a highly desirable place to live and work. If you receive a Notice because of your lawn’s neglected condition or a lack of landscaping, be aware that there are alternatives to traditional landscaping that will increase your property’s value while reducing your water usage AND will comply with the City Code. Are there any programs available to help me improve my landscaping and reduce water consumption? Contra Costa Water District currently has a rebate program to assist in replacing your lawn with water wise landscaping, up to $1,000.00 at www.ccwater.com/157/Rebates. The State of California is also offering a similar rebate at www.saveourwaterrebates.com that you can combine with the CC Water District rebate. Ironhouse Sanitary District is offering a program as a way for residents to water their lawns, trees and plants for free. Ironhouse Sanitary District operates a Residential Recycled Water Fill Station at its headquarters in Oakley to allow residents of Oakley and Bethel Island FREE access to available recycled water. For more information and hours of operation, visit www.isdp2.org/fill.html or call 925-625-2279. Diablo Water is offering free devices to help you save water and also has a water efficient Demonstration Garden that you can visit to see how plants grow using 50 percent less water than a comparable lawn. www.diablowater.org/conservation. Thank you for doing your part to keep Oakley beautiful!